Android is truly one of the best Operating System available for Smartphone & Tablets. Android OS provide a lot of features. Companies are continuously launching new, interesting Apps, Games at various Android Markets. And we are continuously installing/uninstalling Android Apps to test them. The constant installation of new applications, internet browsing and producing photos and videos may end up leaving the device too heavy and finally slow down your device. Even if you have few number of apps or files, your Android device will slow down after some time of the App caches, residual files, junk files, Garbage files and for many other reasons. It’s too hard clear that junk files separately. Isn’t it? Here, I have listed Top Ten Best Cleaner & Booster Apps Which You Can Use To Maximize your Android Performance. Clean Master is all-in-one Android Apps which provides the cleaning and optimizing tools and maintenance tools in one place. 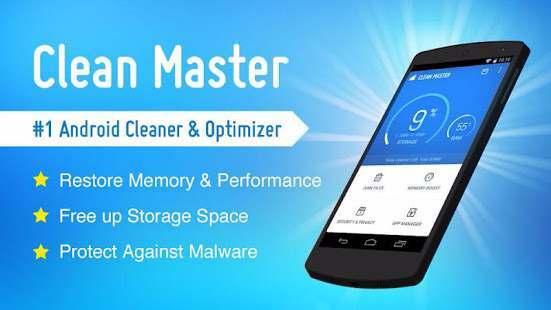 Clean master is most popular clean and maintenance tool for Android which will help you to clean app cache, unused files, residual files, search history and uninstalling apps. In comparation to other apps in this category, it has more tools in one environment and is easy to use. It’s Clean App Cache module will clear the cache files that has been created by the All Apps. If you are having the Android Phone that has low internal storage, Use the Clean App cache module to get more space. It’s App Manager also allows you to take the backup of any installed apps or games, which can be later used to install that app offline. DU Speed Booster is my favorite, one of the best Android optimization tool, which comes with various features. Some interesting features are Trash Cleaner for app cache and junk file cleaning, a one-touch accelerator, app manager, antivirus, a privacy advisor and built-in internet speed test. Again, the benefits of task-killing with accelerators are dubious, DU Speed Booster’s junk file / cache cleaner is a great way to free up internal storage space, and the app manager and other tools are also solid extras. If your Android is rooted then using DU Speed Booster, you can remove / uninstall useless system apps which will make your Android Phone faster. I’m personally using it on my Android Phone. Greenify is the best tool (my favorite one) to kill all running process. However, Greenify is not a cleaner app and thus, it is not going to clean your Android. In fact, you can disable all or selected apps which are installed in your device. You can hibernate any apps (user apps or system apps) by using Greenify. Greenify basically puts an app in a state of hibernation, unable to access system resources, bandwidth or run background processes. However, Greenify allows you to run an app normally in the foreground when explicitly called by the user without any extra fuss. If you’ve got memory or battery hogs that keep draining resources in the background, don’t bother with a task killer when you can just greenify it. Note: Just don’t hibernate alarm clock or messenger, unless you want them to stop working. Recommended: Greenify can be used on both rooted and unrooted Androids, if your Phone is rooted then there is bonus points for you, use this app in root mode for maximum performance. For rooted Android Phone, I recommend you to use Greenify in boost mode with Xposed Framework to get SUPER PERFORMANCE. Yes, it’s the same CCleaner that’s used to clean desktop/Laptop windows PC for more disk space and faster performance. Like Clean Master, CCleaner is a multifunctional app that does its best to analyze and clean up stray files that no longer have any business taking up your precious space. To that end, it’s pretty good. This app has the Cleaner feature that can wipe cache data from apps, purge empty folders, and delete browser and phone histories. The App Manager is a simple interface for picking multiple apps for uninstallation. The System Info page monitors your phone’s resources (CPU, RAM, device details) so you can see what’s going on at a quick glance. Lastly, no root is necessary and it’s completely free. It may be a bit light on the features, but it’s a good alternative if all you need is a quick way to reclaim your phone’s storage space. Just remove junk, reclaim space, monitor your system and browse safely. Become the Master of your own device with the ultimate cleaning app for your Android. 1Tap Cleaner for Android lets you remove the software cache, history, web browsing in browsers, various debris quickly and easily, thereby increasing the performance of your Android devices. Unfortunately you cannot clear the cache for multiple apps at once. You can either clear your entire cache or you can clear the cache for just one app at a time. Startup Manager is the great and useful tool especially for those who reboot your phone often. Startup manager helps you disable undesirable system startup entries when your phone or tablet boots. It monitors and shows the list of start-up apps and resources. To disable an item from system startup, uncheck the application from the list. You can also re-enable the apps or resources using this startup manger’s system startup entries list. You can uncheck all startup entries in bulk to enhance system startup speed. If you want only enable some particular apps, simply enable it in the startup entries. It’s pretty simple, too. Startup Manager detects all of the apps that run at startup, including both system apps and user-installed apps. If you’re worried about needing a rooted device, rest assured: Startup Manager works on non-rooted devices just fine. So, use Startup Manager to boost starting up your Android Smartphone. If you’re worried about needing a rooted device, rest assured: Startup Manager works on non-rooted devices just fine. So, use Startup Manager to boost starting up your Android Smartphone. Advanced Task Manager will display the list all the running tasks, and you need to do is to select some of them to kill it. It’s App management tool is also good to manage all the installed apps.This app will help you to Kill tasks, free memory, speed up the phone, save battery. It automatically kills the tasks every time your screen off. In addition, this app has the quick uninstaller and battery manager. The battery Manger module will display the battery status and battery life. This will let you know the current battery status, according to that battery stats you can decide whether you wanna play with your phone or put it in charging. Android Optimizer feature will manage and optimize the Android device by killing the unnecessary background processes, services. It will clear the unused RAM memory that has been allocated by the unused Apps. This module will help you to get Android phones faster. It’s GPS feature is awesome and useful for navigation and location-based services. Some Location App services will use the GPS in heavy mode and drain out your battery in no time. At that time, you can use their Kill GPS feature to kill the apps that used the GPS services. Certainly this little feature will improve the battery life of your Android Phone. History Eraser is the awesome tool in their category. You can clean browser history, call logs, text messages, search history, download history, app cache files, clipboard data, and more just in a single tap. All of this works perfectly well on non-rooted devices. The free version of History Eraser is supported by ads, but you can remove them by upgrading to the paid version. Some features of History Erase are below. You can clear Clipboard Data, all app cache files. Like History Eraser, Duplicate Contacts & Utilities also available in both free and paid version. If you struggle with hundreds — even thousands — of people in your contacts list, then you should waste no time checking out Duplicate Contacts. As the name implies, it can wipe out duplicates with a single tap, but it also comes with a handful of other useful utilities for managing your contacts. The Exact Duplicate Removal and Merge Duplicate Contacts features are only available in the paid version. The rest of the features are completely free: Let’s see the features. AVG Cleaner is the FREE cleaner tool to save precious space and boost speed! AVG Cleaner lets you quickly erase and clear your browser, call and text histories, as well as identify and remove unwanted cached app data from both the device’s internal memory and the SD card. The app is simple, quick and surprisingly light. From just your landing page in the app it is easy to erase your call and text history, browsing history and, of course, your cache. Another cool feature included in this app is that you can easily set up a weekly cleaning. AVG has done a great job putting this app together and it is a great option for anyone looking for a simple way to clear your cache and history. We must take care of our Android devices and clean it up each day. Keeping your Android devices clean or maintaining the clean Android will help you to prevent slowdowns and give more free space for other resources. The optimization reduces the system burden by freeing up more resources as a result you can get faster performance and smoother operation from your device. Hope this list of Best Cleaner & Booster Apps helped you in Cleaning & Speed Boosting Android’S Performance. You can improve the speed of the Android Phone by using these cleaner & Maintenance Tools. Yes! use any apps and have the Super Fast Android Smartphone. And don’t forget to comment which one is your Favourite. Yes, you are right. Using these cleaner apps, we can easily clean unnecessary junk files from our Android. Which helps us in Boosting the speed and thus maximizing the Performance of our Android Phones. I’m happy to see that this article helped you in Improving your Phone’s Performance. Thanks for your valuable comments bro. Keep on visiting. Thanks a lot man for these apps, I think I have to replace from current DU Booster to CM Security as you said above everthing is there. Hi, thanks for sharing these speed booster apps for Android. Clean Master is really a good option and works well too. Didn’t know about other apps. Thanks for knowing us. Try this amazing Panada Cleaner app. It’s not only used for boost and clean device but it also manages downloaded applications. It can help free up phones space! So Panda Cleaner is best for me. I’m using this app!